The soaked splits, which has reasonably high moisture content, will be passed through Flacker to take them. The flaked guar split will be predried in duct dryer. The dried guar flake will be ground to desired particle size in ultrafine grinder followed by drying of the material in flash dryer. 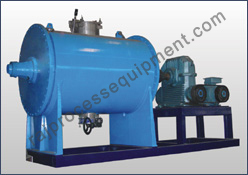 The power will be screened through rotary screens to deliver required particle size. The oversize will be either recycle to main Ultra fine or regrind in separate regrind plant, as per viscosity requirement. This stage helps to reduce the load at the grinder. The soaked splits are difficult to grind. Direct grinding generates more heat in the grinder which is not desired in the process as it results in insoluble or reduced hydration of the product. Through heating, grinding & polishing process the husk is separated from the endosperm halves and the refined Guar Gum split are obtained. Through grinding process the refined Guar split are then treated and converted into powder. During the split manufacturing process, husk & germ are obtained which are used as a cattle feed as they are rich in protein. It is widely sold in the international market as "Guar Meal" and has contents of "Oil & Albuminoids". These contents are about 50% in germ whereas it is about 25% in husks. Quality of the food grade guar gum powder is defined from its particle size, rate of hydration and the microbial in it. E412 guar gum is an important natural food supplement with high nutritional value. Guar splits are screened to clean and then soaked to prehydrate in washing conveyor. Prehydrating stage is very important in the process as it derives the rate of hydration of the final product. 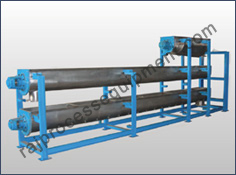 The soaking and conveying of guar splits is totally depends upon the design and manufacturing of hydration conveyor. So it plays very important role in production of high viscous guar gum powder. 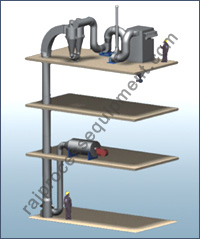 Raj can manufacture single, two, three, four deck hydration conveyors as per process requirements and space available. For achieving of high density guar gum, plough reactor plays an important role. The prehydrated guar splits are dumped in to the reactor and reacts with some chemicals in batch operation of blending. It contains specially fabricated Plough arms fixed on a rotating shaft with a stationary shell. Jacketed or limpets can be provided for heating or cooling. The soaked splits, which has reasonably high moisture content, will be passed through Flaker to take them. Some process need only crushing of the material to meet requirement of coarse material or to feed smaller sized material to another grinder. Two hardened rolls rotate towards each other. They are kept nearer to each other by means of either mechanical devices or with hydraulic system helps to create the pressure on the rolls and make the crushing possible. The larger particles of mass, cereals, pulses are pushed between the rolls uniformly spread and with continuous rate through a separate device. The flaked guar split will be predried in duct dryer. Drying is possible through duct due to smaller sized particles of guar splits which have passed through flaker. Flash drying is a continuous drying plant used for drying of wet cakes and pastes by disintegrating it into fine powder and dried by hot air. The short residence time of one to three seconds requires that the moisture that should evaporate is truly surface water and that the particles in the feed cake are completely dispersed in the drying air. otherwise, the larger particles in the feed material may require a more extensive drying time than the smaller particles in order to reach the desired moisture content. Crushed guar splits can be easily grind in ultrafine grinder. The grinder can grind the material with generation of as much less amount of heat. And finally grinded material fed to the flash dryer for further drying. Unbalance weight on the motor shaft rotates in a plane close to the centre of the mass of assembly. Rotation of the eccentric weights creates vibration in the horizontal plane which causes material to move across the screen cloth to periphery increasing the horizontal throw, causing oversize material to discharge at a faster rate. This is very efficient equipment for screening of powder product. Key Features of complete RAJ Guar Gum Plant. 2. PLC based automated system. 4. Low power & fuel consumption.